Soybean protein naturally contains compounds called isoflavones, predominantly genistein and daidzein. These compounds are not estrogens and do not directly add to estrogen levels in the blood. They can, however, affect estrogen metabolism. Soy protein and isoflavones may have minimal effects on blood estrogen levels in postmenopausal women and in men. In premenopausal women who have much higher natural estrogen levels, eating soy protein likely has no effect. Isoflavones are sometimes called phytoestrogens, mainly because they produce weak estrogen-like activity in the body. Isoflavones bind to estrogen receptor proteins, which, in turn, interact with the genetic material in your cells. Therefore, isoflavones can mimic some of the biological activity of the natural estrogens -- estradiol and estrone. The biological effects of isoflavones are complicated, however. There are two main types of estrogen receptor proteins, and isoflavones bind mainly to only one type. Consequently, the biological activity of isoflavones is not equivalent to estradiol, which binds to both types of receptor protein. A study published in the November 2004 issue of "Cancer Epidemiology, Biomarkers and Prevention" examined the effects of eating soy foods containing about 50 mg of isoflavones per day in 220 healthy premenopausal women. After a 2-year period, blood levels of estradiol and estrone remained unchanged. The authors of the study concluded that any potentially beneficial effect of soy foods on breast cancer risk in premenopausal women probably does not involve lowering of circulating estrogen levels. 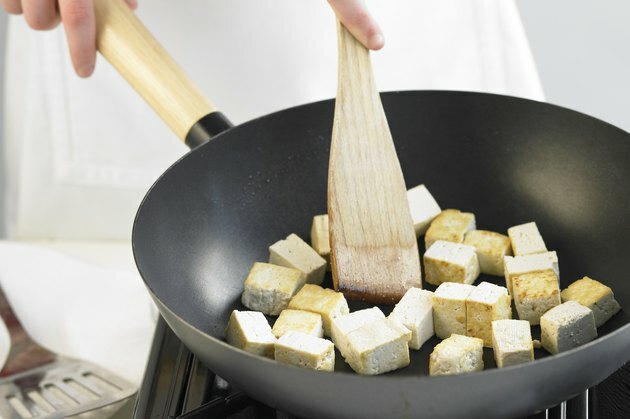 A complete analysis of a total of 11 clinical studies with premenopausal women found that eating soy foods does not affect circulating estrogen levels, according to a review appearing in the July-August 2009 issue of "Human Reproduction Update." The relationship between isoflavones and circulating estrogen levels in 125 postmenopausal women, average age 64, was examined in a study published in the January 2005 issue of "Cancer Epidemiology, Biomarkers and Prevention." In this study, blood estradiol levels were lower in women who had higher isoflavone intake and blood and urine isoflavone levels. An analysis of a total of 21 clinical studies with postmenopausal women, which was included in the "Human Reproduction Update" review, found contrasting results. This analysis found that soy consumption was associated with marginally higher circulating estradiol levels. The increase was not statistically significant, however. A study published in the March 2005 issue of "The Journal of Nutrition" investigated the effects of soy protein and isoflavones on blood estrogen levels in 35 healthy men, average age 28. After 2 months, men consuming diets containing soy protein rich in isoflavones had blood estrogen levels slightly higher than men consuming milk protein, although the increase was not statistically significant. However, men eating soy protein with most of the isoflavones removed had significantly higher estrogen levels than men eating milk protein. The researchers conducting this small study concluded that these effects were "minor."